I’d venture to say that most British people over the age of 30 grew up on Maris Piper potatoes. During my childhood in the Berkshire ‘burbs, we ate potatoes at least five nights a week – baked, roasted, but mostly boiled. Pasta and rice were exotic ingredients in the ‘80s – potatoes were the staple of families headed up by the baby boomer generation. And Maris Piper was the default variety. So it was with a mixture of surprise and familiarity that I discovered a restaurant by the same name in Amsterdam. I mentioned it to some Dutch colleagues, and they’d never heard of the potato variety so I’m fairly sure that Maris Piper doesn’t have the same history in Holland that it does in the UK. 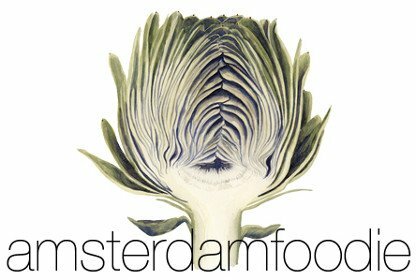 I was intrigued… Not only about the name, but also because the brains behind this restaurant are the same as those behind Breda – one of my long-time favourites in Amsterdam. And while I hadn’t been quite as enamoured with their second venture, Guts & Glory, I was curious to give another of their restaurants a try. First, the location: Maris Piper is on a doomed corner along Frans Halsstraat – “doomed” because I’ve seen half a dozen different restaurants come and go from the same spot over the last decade. None of them have lasted. It’s hard to understand why – de Pijp is full of locals and tourists at any time of year, and the building looks designed to be a brasserie. There’s no reason it shouldn’t work, but many businesses have tried and failed. 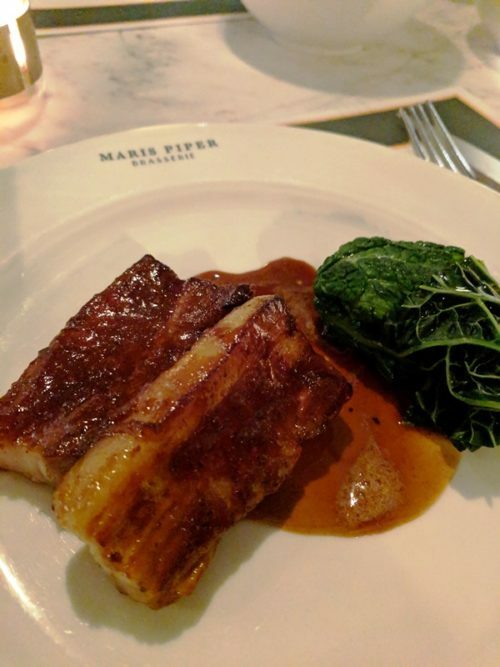 Maris Piper, too, has stuck to the traditional brasserie layout and décor in its restaurant – and it certainly looks the part. The menu also reads like a French brasserie card: A3 format with boxes featuring an abundant choice of classics like oysters, steak tartar, Caesar salad and poussin, as well as Dutch influences like herring and smoked eel. The wine list is extensive – and expensive. We ordered a €35 bottle of Brachetto and it was the cheapest on the list of reds. But I’m ok with that if the overall experience delivers on value. We ordered two dishes to share as starters: octopus and burrata. 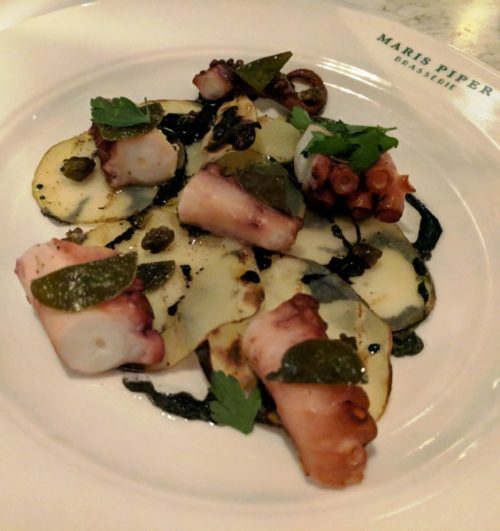 The octopus came grilled, and served with discs of potato (presumably of the Maris Piper variety) and a dressing made of the octopus’ ink plus a few unidentifiable crunchy bits. It tasted fine, but the portion size was small and the octopus itself not as tender and flavoursome as it could’ve been. Meanwhile, the burrata was nothing special either: I missed that buffalo flavour, and it came swimming in a watery dressing laced with basil oil, plus a few chopped tomatoes and olives for good measure. Again, there was nothing wrong with it, but for the price (€14.50 for the burrata, €17.50 for the octopus), I’d have expected more – either more food or more oomph. I’d ordered the Zeeuwse spek as a main course, which was succulent braised pork belly served with a little parcel of sauerkraut wrapped in savoy cabbage. Flavour-wise, this was probably the best dish – there just wasn’t much of it. To make up for it, we got three side dishes to share: Maris Piper chips, baby broccoli and barbecued cabbage. The latter tasted like it had been cooked in advance and reheated – the cabbage leaves had a slightly stale quality to them, although it was masked to some extent by the beurre blanc. The broccoli were primped with pine nuts, but were let down by an overly vinegary dressing.